The European Union, with only 7.5% of the world’s population, is responsible for a major part of the contamination of the planet, and is a major contributor to the problems of the global environment. Fortunately, Europe has both the capacity and the experience to fight effectively against these problems, even in this ‘twenty-fifth hour’ of environmental degradation. 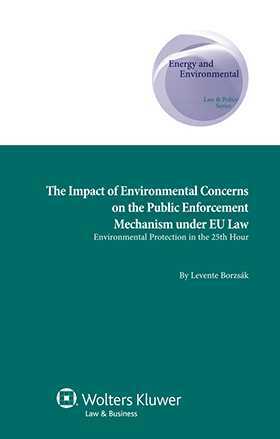 This timely book identifies some of the weaknesses of the public enforcement mechanism inherent in Articles 258–260 TFEU, and suggests how that mechanism could be improved in order to promote the overall effectiveness of EU law and environmental law in particular. what happens when a Member State fails to pay a penalty. The analysis covers the range of instruments, programmes, and institutions used by the EU to promote compliance with environmental law, such as LIFE, IMPEL, training and education schemes, and various financial tools, and also describes the role of the European Environment Agency and other statutory bodies. Detailed studies of cases which have arisen under Article 228 EC (now Article 260 TFEU) underpin the analysis, revealing common issues and emerging principles. An in-depth study of available approaches under EU law to effective recognition of environmental imperatives and better compliance with existing provisions, this important book offers practical recommendations that will improve and speed up infringement proceedings and strengthen both preventive measures and enforcement mechanisms. It is an essential resource for European lawyers and policymakers concerned with preventing further irreparable damage to our environment.